In this week’s show we talk quite a bit about the tech behind the live show. I did a new diagram of how I broadcast my audio, Steve’s audio and my video to YouTube Live and to Alpha Geek Media and more. I created it with draw.io and you can see it at podfeet.com/blog/nosillacast-live/live-show-setup/. I made a 1 minute long video for Megan Moronne and Leo Laporte to talk about how the Smartbean from Antec can turn any headphones into Bluetooth, but my cat Ada sorta photo bombed it. I walk through the different methods of screensharing I use, including Skype, Messages and how adding QuickTime into the mix lets you include your iOS screens in the screen share. NosillaCastaways are becoming more fit and healthy because of our recent discussions and i read you a few anecdotes and tell you how even I upped my game because we’ve focussed on the tech. Bart Busschots is back with Security Bits too. Hi this is Allison Sheridan of the NosillaCast Mac Podcast, hosted at Podfeet.com, a technology geek podcast with an EVER so slight Macintosh bias. Today is Sunday August 21, 2016 and this is show number 589. The creation of the live show is a lot of work but it’s something that gives both Steve and me great pleasure. The audio podcasts are by far the most downloaded thing we do at Podfeet Productions, but the live show is still a lot of fun. We’ve seen friendships grow amongst the attendees that go far beyond the live audience discussions, we’ve made friends of course, and I think the audience really enjoys when things go horribly wrong. I think it’s like when you go to a car race you hope nothing goes wrong, but a spectacular crash where the driver walks away unharmed is pretty cool. Last week on the show I had a weird audio problem where the live audience and I could hear Steve in the Hangout on Air, the live audience and Steve could hear live audio from playback in my audio recording software Amadeus Pro, and everyone could hear me. But the minute I turned on streaming to the live audience through the purely audio (not video) feed, I couldn’t hear anything at all. It would make it just a tad difficult for me to edit the audio show that way, right? Before I tell you the next part, I want to give a shout out to Dan, aka DANVA3ETS in the live chat room for being the one who helped me actually solve my audio problem this week. Anyway, when something like this happens, and I have to spend time diagnosing it, I’ll often share my screen and noodle the problem out loud with the audience in the chat room. The audience has a term for this, they call it “watching the sausage get made”. Probably one of the longest standing members of the live audience with the best overall attendance record, is Kevin Allder, aka Big_in_VA. He is also the self-avowed wingman to Steve. Well this week, he sent us a little present. He sent…a sausage maker. Technically it’s a meat grinder but it says right on the front that you can make sausage with it. It’s just this kind of dedication to quality and seriousness that makes the NosillaCastaways the best audience in the world. 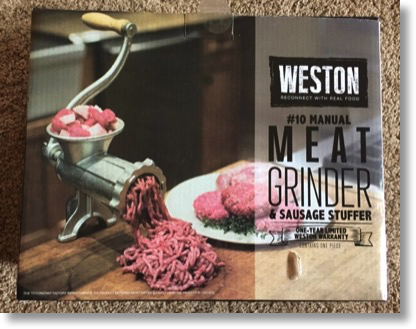 I’m willing to bet some serious money that no other podcaster has been shipped a sausage grinder. If you came to the live show, you’ll know that of course I did a live unboxing. Last week I told you about a free diagramming tool called draw.io that I suggested you could use instead of Omnigraffle. After the débâcle with the live show audio, I went back to review my diagram of how the show works (podfeet.com/blog/nosillacast-live/live-show-setup/) and realized that I’d made some changes since the last time I updated it. I do the diagram for two reasons, one to remind myself of what I’ve done, but also when I have to draw it, it makes me review to see if what I’m trying to do makes sense. I realized that to edit the diagram I would have to launch Omnigraffle. That got me thinking I should put my money where my mouth was and see if I could reproduce the diagram using draw.io. If I could remake that diagram and make it look good, and also not find myself swearing at the tool, that would really prove it out. I enjoyed remaking the diagram so much that I stayed up super late working on it. I had easily and quickly replicated what had taken me far longer on Omnigraffle (and frankly it was slightly prettier on the free draw.io), but I became so inspired that I started to improve on the diagram. I added a page of explanation of what I was trying to accomplish (read that as “what problem are you trying to solve?”) because I thought anyone looking at it might need that to understand why each piece was there. Then I realized that the single page model with all the hardware and software listed AND the flow of audio and video being all on one page was getting too cramped, so I spread it out onto separate pages. In the morning I had an epiphany of something else I forgot to include. But I was lounging in bed with my iPad Pro, a cat, and a cup of coffee. If I’d done the diagram in Omnigraffle I would have had to get out of bed and disturb the cat because I never paid the extra $50 for the iPad version. But since I used draw.io, I was able to easily edit the diagram without upsetting Grace. It wasn’t quite as easy as doing it on the Mac, but every bit of the functionality was available to me. I had a blast doing it, and in fact in the middle of writing up these notes about it I got all crazy and changed a bunch of plain boxes into pretty icons representing the tools. You can lose hours playing with diagrams like these! I justify my obsession though that if I pay attention to making it look good, it tells the story better. You can see a mic an know it’s a mic instead of having to read it. If a line is slightly skewed, it will take your brain out of the moment. In any case, if you want to see the diagram of the sausage getting made, you can see it now over at the link in the shownotes. Steve and I use Google Hangout on Air to create the video component of the live show. As of September 12th, Google will move Hangout on Air out of Google Plus and into YouTube Live. It’s not any big catastrophe, but it will take some learning by Steve and me on how to do this. this afternoon we did a practice session from YouTube Live with Denise Crown as our “audience”. It was a bit meta as we started with a normal Hangout on Air the old way and I shared my screen so Steve and Denise could help me figure out what buttons to push in YouTube Live to make it go. Denise finally cracked the code, so we dumped that Hangout on Air and started a new one and it worked perfectly. The only thing we’ll lose is that if you’re used to getting an invitation through Google Plus that won’t exist any more. On the other hand, maybe it irritated you that I invited you ever week! The good news is that the chances of me crashing and burning in creating the live show will go up dramatically for the next few weeks! If you haven’t been before, check it out at podfeet.com/live. Like many others, Leo Laporte and Megan Moronne of iOS today, have been wringing their hands about the possibility that Apple will get rid of the beloved headphone jack. I’m not terribly worried about it because I use the Smartbean from Antec that I’ve told you guys about a bunch of times. You plug in any standard headphones into the Smartbean and it turns them into Bluetooth headphones. Anyway, I decided to make them a little video (they love viewer-contributed videos) about the Smartbean. I did about 20 takes for this dumb little 1 minute video but finally I nailed it all the way through. If you’ve ever been to the live show, you will have noticed that from time to time my cat Ada (named after Ada Lovelace) has a bad habit of jumping up on the back of my chair when I’m recording. Well, she did it when I made the video for Megan and Leo on the ONE time I nailed it. So I published it with her in it! It’s short, and mildly humorous so I put a link in the shownotes to the video for your enjoyment. If you watch iOS Today they said it should air on Monday. Great show, but UK listeners be warned live.atc app won’t work for UK airports. Very sad about this as I’d pulled the car over to download such was my excitement! Here’s the link fo the Stanford infographic that Bart mentioned, in case anyone is interested.